With approimately 200 miles of dirt roads and more than 40 miles of trails open to bicyclists, the San Jacinto Mountains around Idyllwild offer a number of experiences for mountain bikers of all levels. For that reason, the local mountain trails have become extremely popular among riders looking for challenging routes and breathtaking scenery. Local trails provide mountain bikers with a diverse selection of roads from which to choose. The Forest Service has mountain bking regulations in the San Jacinto and Santa Rosa mountains to ensure the safety of riders and the protection of natural resources. Bicycles may be ridden on established raods and trails within the mountains; however, bikes are not allowed within the San Jacinto or Santa Rosa wilderness areas or along the Pacific Crest Trail. If parking a vehicle on Forest Service land in the areas of Thomas Mountain and Black Mountain, Lake Hemet and Humber Park, visitors must display an Adventure or Recreation Pass in their vehicle. 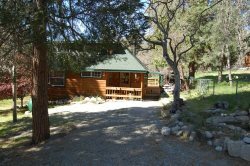 Call the Idyllwild Ranger Station at (909)382-2922 fro more details. The pass is available in two forms: a daily pass for $5.00 and a $30.00 annual pass good for one year from the month of purchase. Passes are available at the Forest Service office and serval other vendors around town. The Forest Service also offers these safety tips for mountain bikers: Keep your eyes and ears open for equestrains and hikers on trails and vehicles on roads; helmets are highly recommended; control your speed; avoid riding after dark; and, carry a map (available at the Forest Service). Idyllwild is home to some of the best mountain biking trails in the west. For more information on mountain biking, races and events contact "The Hub Cyclery"